and will always be remembered by those who knew him. for McIntosh related sites and personal information. 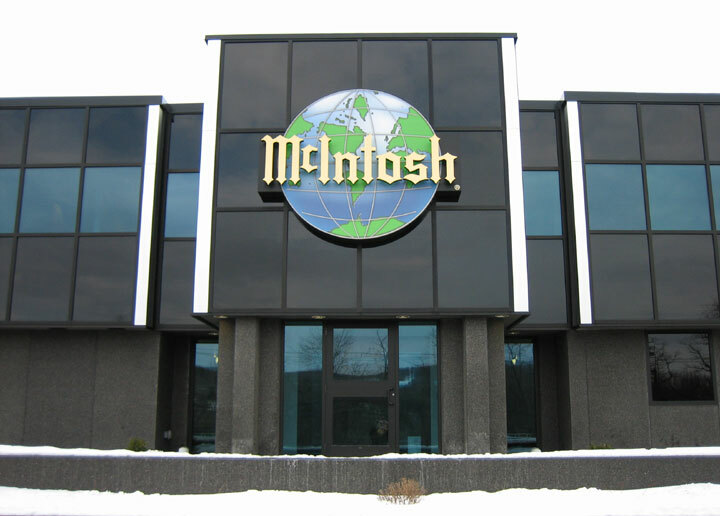 McIntosh Laboratory Inc. is located in the southeast corner of the city of Binghamton, NY. This is the main plant (Plant 1). It is located at 2 Chambers Street. This is a short dead end street that connects with Conklin Avenue, which is NY route 7. The Susquehanna River is on the other side of route 7. Renovation of the front portion of the main plant was completed in early 2007. Combined with a globe that lights up at night, this updates the building with a modern appearance like those found in many industrial parks. Dave O’Brien passed away on January 9, 2007. He was born on May 3, 1928 in Worthington, Ohio. He was the son of Margaret K. and Harry R. O’Brien. He is survived by his brother Donald and nieces and nephews. He will be remembered by many people who met him at the McIntosh clinics where he tested more than a million amplifiers all over the United States over a span of 30 years. Dave also wrote a 53-page book about his experiences. In all those years, he encountered some unusual situations, some very funny and some very touching. It’s all fascinating reading and there are lots of color pictures. In 1962 McIntosh Laboratory Inc. started what was to become one of the most successful and longest running marketing campaigns in the Consumer Electronics industry, The McIntosh Amplifier Clinic. McIntosh amplifiers were and are "Still the Best" but they had to find a way to prove it to the Consumer. They did this by testing amplifiers in stores; with Customers as witness they were able to show that McIntosh was the best. David H. O’Brien may be the face and name most synonymous with McIntosh outside of Gordon Gow. He tested more than a million amplifiers all over the United States and Canada for nearly 30 years. 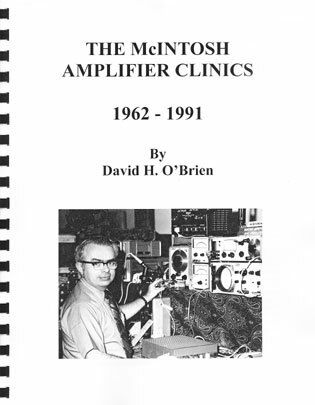 Now, you can read the story of "The McIntosh Amplifier Clinics" written by Dave O’Brien, available exclusively thru Audio Classics for $19.95. This site map is for McIntosh history pages. How McIntosh Laboratory started with Mr. Mcintosh's consulting service in Washington, D.C. and up to 1972. Design description of the C26 preamp. Continuing McIntosh Laboratory from 1973 to the present day. How the loudspeaker division started with Roger Russell and up to 1975. New information on how to restore and upgrade the ML-1C. A 1971 loudspeaker seminar by Gordon Gow. Continuing with loudspeakers from 1976 to the present day with many design and test descriptions. Includes Speaker Wire: A History. It started with the ML-1C and MQ101 equalizer. Later, it evolved to include room acoustics and then McIntosh acoustic test equipment plus further refinements. Lots of pictures and text. Presented in four parts. JRB advertising began in 1964 and expanded to direct mail. It was closed down in 1992. 15W1 to MC2125 in numerical order. MC2150 to MC7300 in numerical order plus MK30 and industrial amplifiers. HT-1 to XE10 listed alphabetically. XL-1 to XRT26 listed alphabetically. MR 55 and later in numerical order. Includes CD players, performance indicators, equalizers, analyzers, control relays, cartridges, remote systems, video switchers, cabinets and accessories. A list of reviews and related material about McIntosh found in magazines, books and journals. Contains name and date of publication as well as page number. but soon, and for the rest of your life!" What are the names of the movies that you have seen with McIntosh equipment somewhere in the background? Suggestions are welcome. Here's the beginning of the list that may be correct. I haven't checked all of them out yet. 9 1/2 Weeks (1986) starring Mickey Rourke and Kim Basinger. MC2155 closeup of one meter and countdown numbers. Pillow Talk (1960) Doris Day and Rock Hudson. C-8 preamp. Can only be seen in the wide screen version. Stepford Wives (remake) Nicole Kidman. MC2000 can be seen.